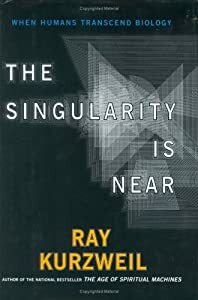 Ray Kurzweil believes the exponential growth of artificial intelligence, biotechnology and nanotechnology means that before 2050 his consciousness and identity – can be copied and uploaded into a non-biological form transcending biology and achieve the dream of immortality. A wonderful illustration of this principle is the contrast between the Old Testament dictum of ‘an eye for an eye a tooth for a tooth’ and the Christian prophet’s instruction to turn the other cheek. By this simple statement Christ illustrated the nature of consciousness set against that which is not conscious. A computer program or a non living static-dependent object (by that I mean – a robot) can only follow an eye for an eye, action and reaction. A conscious and thus self evaluating being can intercept that chain of events and change it regardless of implied trend. When Jesus said “If a man asks you for his coat give him your cloak also” he was illustrating the same principle. Conscious being can change the course of events, do that little bit more than simply respond to stimuli. In fact it could be said that every positive quality that has a unionizing momentum that might be termed ‘love’ is an expression of consciousness intercepting the entropic chain of cause and logically implied effect. In his unbridled enthusiasm to recreate his identity does Kurzweil believe that his self awareness will be there to appreciate its own virtual eternity? Will he be there to view and appreciate his virtual self? “In the 2040s,” says Kurzweil, “the non-biological proportions of our beings will be powerful enough to completely model and simulate the biological part. It will be a continuum, a continuity of pattern.” But is self awareness recreated by repeating the pattern of a self aware being? Would you be there to know your own artificial re-creation? Or would it be accurate to say that Kurzweil’s singularity is actually a dead end, nothing but an empty go-nowhere image of the conscious, aware singularity that preceded the Big Bang? This entry was posted on March 27, 2011 at 6:57 PM	and is filed under Conspiracy Archives. Tagged: Accelerating change, Artificial intelligence, earth, Exponential growth, machine world, matrix scenario, Moore's law, Ray Kurzweil, Second Law of Thermodynamics, The Singularity Is Near. You can follow any responses to this entry through the RSS 2.0 feed. Both comments and pings are currently closed.